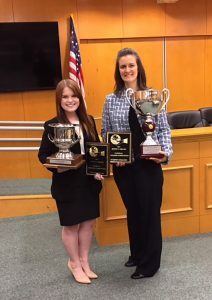 Students from the Frank Evans Center for Conflict Resolution at South Texas College of Law Houston (STCL Houston) recently won first and second place at the Jeffry S. Abrams National Mediator Competition at the University of Houston. Third-year student Mildred Scott won first place, and third-year student Ashley Thomas won second place at the competition. This is the third first-place win for STCL Houston students in the four years the law school has competed in this tournament. This event drew competitors from law schools around the country for five rounds of mediation problems. In each round, judges evaluated students on their effectiveness in facilitating negotiation, active listening, and other communication skills. As in past alternative dispute resolution (ADR) competitions, South Texas College of Law Houston alumni played key roles in coaching current students for this mediation challenge. In particular, alumna Kristyn Koch ’14 coached both of these winning students. Currently a contract coordinator at Shell, this is the third time that Koch has coached students to a first place win at this national competition. STCL Houston’s ADR teams regularly compete in up to nine events each year – more than any other law school in Texas. The law school’s rigorous selection process, dedicated alumni coaches, and the leadership of Debra Berman, director of the school’s Frank Evans Center for Conflict Resolution, have garnered 13 national and international first-place championships in recent years – three in the last year alone. The Frank Evans Center for Conflict Resolution serves as the focal point for dispute resolution education at STCL Houston. The Center’s primary mission is to train law students in both the theoretical foundations and practical applications of dispute resolution policies and procedures. Currently, STCL Houston offers eight ADR-related courses, including a Mediation Clinic, and a 40-hour basic mediation training, open to both students and professionals. Approximately 125 students obtain the law school’s 40-hour mediation certificate each year.